I went to my first pig pickin’ this weekend and…¡Wow! Growing up in Massachusetts, the only thing I can compare it to is a clam bake, which, oddly enough, usually centers around lobster. After having access to a whole hog on a smoker, I have a newfound appreciation for a) how difficult it is to get at lobster meat and b) just how much meat is on a pig. While Doug and his neighbor Jeff did use a gas cooker, at least they had a pile of wood nearby to please the eye. Plus, they woke up at 5 a.m. to get things started, earning some nice legitimacy points. While this should have been obvious to me beforehand, the best part of the evening was actually pickin‘ pieces from the smoker. Finding that perfectly crusty piece (like this little gem to the left) was an experience I’d love to repeat (and did quite a few times on Saturday). 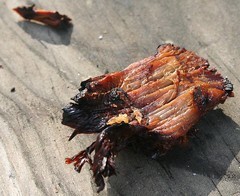 If I have to split hairs, I thought the barbecue could have been chopped finer. But I can certainly imagine the cleaver guys getting pork elbow after working their way through most of that hog. The kicker of the whole thing was meeting a nice Jewish family who’d moved to Carolina from Israel. Alas, being Orthodox, they didn’t partake of the pork. The poor souls. But, as a devout BBQ Jew, I could understand their devotion. And we met in the middle at a keg of nice, local beer. 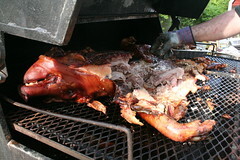 Having grown up in NC and having been to a fair share of pig pickin’s in my day, it is something I actually have missed. I’ve not been to a true one (not like what they have at Hog Happenin and such) in some time and they were all coal or wood chip oil barrel cookers. I don’t worry about how the pig is chopped because I was able to pick which parts to pull from the pig. Also the sauce was really good (and vinegary) and homemade. I’m surprised you didn’t mention the fact that you could also grab some pork skin along with the meat which a lot of people miss out on when they go to the joints. I like the skin okay (sometimes more than others). 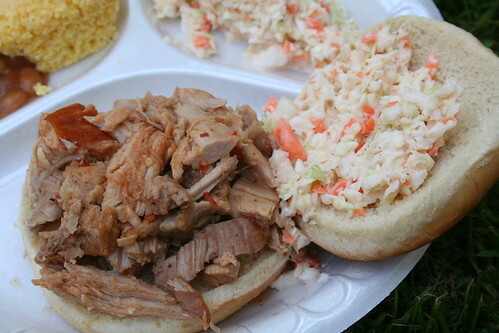 Pig Pickins’ may be a dying thing based on time and cost. Maybe you missed my ‘outside brown’ reference, but rest assured that I, too, enjoy the skin. Nope I saw it sorry. I stumbled upon your blog thru bing. I really like the contents which are well written and informative. I have bookmarked your site and will certainly visit again. Keep up the good work.